Today I made a wordle describing my holidays. I put in some of the things that I am going to do or already did. I also included some of my feelings. I have put in two photos because the top photo was a bit blurry, so I took a photo of my screen with my camera. This wordle looks awesome! 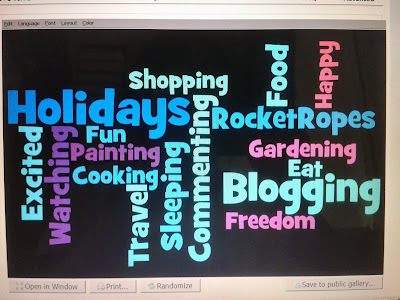 I love the colors in your wordle. I should make another one these holidays. Keep up the splendid work Angel. Your wordle looks very colourful. These are some good things that you can do in the holidays. I hope your holidays are going very well.